Draft pour into a shaker pint glass at Beachwood BBQ. A: Clear, light amber color with one finger of persistent white foam head. Heavy lacing remains on the glass. S: Intense juicy citrus, equal parts tangerine and grapefruit, overwhelm the nose early. Some pine and caramel are able to peek through after the passage of some time. No alcohol is detected in the smell, and it is otherwise as powerful, focused, and clean as any of the style. T: Begins off-dry, with pungent grapefruit and pine hop aromatics, and bright moderate acidity. Flavors become more dry in the middle, with aromatic flavors turning more flowery. Toasted pale malt begins to come into focus but never becomes becomes balanced, instead being continually outweighed by the hop presence. The finish is extremely bitter, overshadowing any other flavors that may remain. No alcohol is detected in the flavor. M: Thin to medium viscosity, resinous and slightly acidic on the palate, with moderate carbonation. D: Moylan's Hopsickle may be the first DIPA I ever truly enjoyed--back when the style was challenging and extreme in a way that most beers simply weren't. Since that time, I have returned to it whenever it is offered on draft, but I have avoided the bottled version due to its price and questionable reputation. On draft this beer has withstood the test of time, with a smell and a look that could not be improved. It is a staggeringly bitter example of the style, which is saying a lot; it may seem difficult at times to appreciate the well-cultivated hop aromatics and the nuanced malt contributions amidst the dominant bitterness. Still, it is a great example of the style and should absolutely be sought out on draft. Hugely hazy titian that looks like equal parts orange juice and sweet apple cider. The edges are smoky orange in color, further evidence that there's a lot of *something* present. Here's hoping that something is hop flecks. Given the language on the silk-screened label ('super hoppy', 'in celebration of the hop', 'a hop tribute'), I'd say hops are a good bet. The head is pale caramel in color and is firmly creamy. A thick blanket of lace has already shown up, leading me to expect a glass coater. Super hoppy is right! The nose screams HOPS with full-throated gusto. This American DIPA is absolutely bursting with sweet, juicy fruit: orange, grapefruit, pineapple and passionfruit at least. If the hop bill wasn't printed on the bottle (Tomahawk, Cascade and Centennial), I would have bet the farm that Amarillo was in there somewhere. Pine sap is a welcome contributor as well. Hopsickle has too much caramel malt for my tastes. The sweet caramel candy stickiness blunts the bright hoppiness to a significant extent. This Moylan's offering falls decidedly into the balanced DIPA camp (that is much closer to an American barleywine), not the souped-up, IPA-like DIPA camp. That makes it sweeter than most, with a brown sugar syrup quality that I'm enjoying. As noted, the hop flavor has been rendered earthbound by gooey liquid caramel. Grapefruit peel is the dominant hop flavor, with the more tropical fruit qualities of the nose falling by the wayside. Bitterness is still substantial however. This is a major tongue ruffler, a quality that sneaks up on the drinker due to the smoothing, soothing character of all those malt sugars. The mouthfeel is as expected. That is, full, heavy, syrupy, sticky, honeyish, etc. Since the ingredient that keeps me from loving the flavor profile is the same one responsible for the gargantuan body, I can't very well give it a perfect score, can I? I'd gladly trade a little mouthfeel for a more hop-dominant beer. Hopsickle is a great name for a DIPA, but Hopsickle isn't a great DIPA. My preference should be obvious by now. Simply put, malt doesn't deserve to share the stage with hops in beer of this style. I still feel fortunate to have had the opportunity to try this one. Thanks lou91. Maybe I had a bad bottle.. but it wasn't anywhere close to an A beer. Hopsickle pours a cloudy dark-amber body beneath a frothy head of ivory that holds remarkably well and leaves some very nice lacing about the glass. It's initially a bit sparse as the head settles to a creamy cap, but beyond that it leaves creamy rings that meld together to make a solid curtain! Very nice. The aroma is decidedly hoppy, offering grassy and herbal notes, followed by glistening pine, and then citrusy, berry, and tropical fruits (tangerine, strawberry, pineapple, papaya). A sweet, caramelish and sweetly bready malt base accompanies the hops, or at least tries to tag along. In the mouth it's full bodied, and very dextrinous. It's pretty much like wort. And it's smooth as well, with a very fine bubbled median carbonation (thanks to bottle-conditioning). The hop acidity and alcohol, however, do affect the tongue, leaving a sharp zest that livens it. ... as to drinkability, we have at least four facets to look at. #1 is volume... How many servings can you enjoy in one sitting? #2 is overall enjoyment, as in "how many servings would you like to enjoy in one sitting, if you could?" #4 is how many servings can you enjoy before you pass out from the strength? I don't know. In a way, after having a lot of hops and malt and heat thrown my way I kind of like the almost vodka-like heat of it. But I've only had 12 ounces and I've already passed beyond the ability to properly taste, so I guess that makes sense. And, it's made me a little tipsy. So what now? Well, like many strong beers, I just sip it. But the flavors are lost. So at this point, why not just drink vodka? The start was great, a big freakin' explosion of hops and malt and alcohol - but like most explosions, it was powerful but short. I've thrown the numbers in as I see them, all 4's. The appearance almost clocked a 4.5, but it wasn't quite there with all of that haze and just not enough lacing to match. And the aroma was very good, but not great. I've had lesser flavored IPA's that have put forth a much more aggressive aroma. And the flavor is solid, but choked. It comes out in segments, rather than delivering as a rounded whole with spotlights on different elements of it. And although it is kind of balanced, the alcohol is quite hot, which is never good. So for drinkability I give it a 4, and I even question that. "Dis" me if you may, but I've had better double IPA's. Pours apricot orange. Head is thick and sticky, sheets of lacing. Aroma is resinous piney hop. Fruity with grapefruit citrus, and candy sweet caramel malt. Taste is a hop onslaught. At first piney citrus, then awash in pungent earthy hop. Overshadowed is the sweet maltiness with brown sugar. Finish has lingering hop bitterness and a leafy green hop character that stays awhile. Slight warming sensation from the alcohol, but is well hidden given the ABV. Mouthfeel is medium bodied with enough hop oil slickness to coat your tongue. Hop heads will love this brew. However, there isn't a great deal of balance so the uninitiated should beware. Dangerously easy to drink. A: Poured into a tulip glass. A hazy light copper color with a thick off-white head that dies down to a half inch of dense off-white foam leaving webs of lacing down the glass. S: Toasted malt with some dank hops. A very resiny hop aroma here. A little bit of grassy, citrus and pint hop oils. T: Up front the toasted malt is quickly taken over by some grassy and citrus hop. The hop is oily and resinous. In the middle of all the hop and bitterness, there are some good fruity esters that add a nice depth to the beer. Finishes bitter and dry. M: A bit thick in body with an oily feel to it. Dry and bitter in the finish. Low carbonation. O: An excellent DIPA. The alcohol is well hidden and the flavors are top notch. Appearance: Copper-red, medium-small head, and great lacing. Smell: Hops and slight spice. Taste: Malty hop goodness and a slight citrus. It's got powerful hops and is very rich with a final bitterness. Fluffy white head stays around for a awhile and sits atop a slightly hazy amber-golden liquid. Sheets of lace coat the sides of the glass. Ok - this is one hoppy smelling beer. Loads of citrus (ruby red grapefruit),pine, herbs, and wild flowers. A vague fruitiness abd mild malt sweetness aroma peak out for a moment. Other than that, it's all mouth watering hops. With the first sip you know this is a beer for the masochist in you. Big and bold bitterness with a juicy middle. Hops kick it off and stay throughout. There is grapefruit flavor in a beer, and there is this beer thats starts is grapefruit juice. Floral, piney, herbal and faint tobacco flavors come next. Pure mouth puckering hoppiness in every sip. There is a nice maltiness, just like a fresh baked French baguette, that steps in and attempts to balance the hops. The most it can do is slow the pain. Finishes with lingering spice. Alcohol is well hidden at first, then kicks in half way through the bottle adding warmth and fruit. This beer is an assault on the taste buds. Medium in body and smooth, but very tingly on the tongue. Thinner than expected. I've heard of beers decimating the palate, and now I've had the pleasure. I really like this beer and it drinks too easy between all the hops and alcohol, but I don't think I'd ever pop open another bottle. Hail the biggest and baddest pure hop bomb I've had to date. No disrespect to Stone, but I'm not sure if I'm worthy. Pours a chrystal clear amber color with a nice light tan head that leaves very nice lacing that does stick around for quite a while. Lots of hops present in this smell, although what I smell is mostly citrusy and piney aromas from the hops. There is also a nice presence of sweet light malts, a fine compliment to the strong hop smell. The hops don't let up in the taste that's for sure, plenty of hops here, alot of pine taste mixed with a deep earthen flavor. There's also sweet buttery malty taste to somewhat balance out the hops, though the hops still definitely prevail. There's also a bit of sweet grapefruit taste as well, but I'm putting my money on that coming from the hops. The beer could stand to be a bit more carbonated but overall it's a damn fine beer and I'm glad I picked up a few!!! My bottle looks different from the one pictured above. I hope this is the same beer. 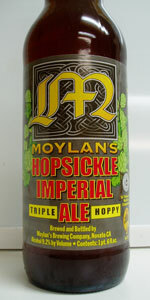 My bottle says Moylan's hopsickle imperial ale.. triple hoppy. There is no freshness date but a 2006 award. This beer pours a cloudy apricot color with a white head. The lacing on the side of the glass earns a "5". The beer smells of hops. Some of the hops remind me of fresh green hemp. This beer smells sweet of summer temperate climate fruits like plumbs, apricots , and apples. Tastes of oil laden hops. Hops so intense, that it is past hop bitterness. This will satisify all hopheads. Sweet like the smell too! This beer is just a bit over the top for my personal tastes. Over hopped. But that is what I expected! A great Dipa...or TIPA..tripple IPA? A- Pours a bright golden color with hints of amber. Fluffy white foam that clings well. T- A hop bomb it is! Teeth searing hoppy bitterness initially that eases into citrus and pine flavors. Easiest to pick out are ruby red grapefruit, orange peel, pineapple, pine, and floral hints. Believe it or not, but this actually has a nice smooth finish with some light malt sweetness to help ward off the hoppiness. M- Medium bodied with lots of carbonation. D- Well, it's a hop bomb with an easy finish. Very drinkable, but probably not really easy to put more than one or two away. Hazy light copper, with some red highlights. Thick, sticky beige head settles slowly leaving nice lace. Nose is a huge blast of raw hops - peach pit, pine pitch, orange and lemon zest, dried pine needle. One hella hoppy nose. Miraculously, a bit of caramelly, bready malt manages to poke through. Medium in the mouth. Quite nice balance between the hop flavor and malt. The hops are, not surprisingly, on the citric side, and last throughout the palate. The malt is quite light, but still present until the long, mildly bitter finish kicks in. Malts are refreshingly not overly crystal in nature, with warm bready notes dominating this aspect of the palate. Finish is medium long, and a lick of the lips gives a nice rehash of the hoppy goodness. Carbonation level is relatively low and fine in nature, which gives a soft, mouth-filling character to the beer. Really well done, and avoids accentuating the substantial bitterness too much. Quite drinkable for what it is. I can certainly finish a bomber, and were it in 12 oz. bottles, might have designs on a third bottle over the course of an evening. Thanks to Marc77 for the fine trade. this beer poured a murky orange with about a finger of nice thick rocky bubbles that stuck around leaving bits clinging to the side of the glass. the hops seem to be very citrusy and piney at the same time. the beer also smells like it's going to have a nice malt backbone. i have high expectations. alcohol is detectable in the nose. the taste is quite bitter at this time. straight pine tree and lemon zest. the alcohol is present in the taste as well. picking up grapefruit as the beer warms. the balance might be a little off for me on this one. the mouthfeel is lush and full. expected for a west coast dipa. overall, this is a very nice brew. it's a hopheads dream for sure. D - What a beer! could use a little more on the aroma spectrum, but it sure does taste great! Goes down smooth for the high ABV, but I wouldn't have more than two in a night! I just got in from cutting the grass and needed something hoppy to quench my thirst. Luckily I had a Hopsickle chilling in the refridgerator. The beer pours a very clear copper color with a big creamy white head on top. The foam dissolves slowly to a thick sheet on the surface of the beer and leaves behind lots of clumps of lace on the side of the glass. A strong hoppy aroma of pine mixed with some citrus grapefruit and orange. This full bodied brew is somewhat chewy and very smooth. Definitely a sipping beer, however it hides the 9% alcohol very well. The flavor is much like the aroma, hoppy pine, grapefruit and orange citrus. There's some toasted malt in the background trying to balance out all the hops. It finishes with a bit of alcohol and grassy notes. I'm not sure if it's the beer or me, but I found the strong hop flavor to fade a bit as I drank the beer from my glass. It's almost like my tastebuds gave up, ran away and hid under my tongue as this beer was being poured down my palate. I also noticed that the hop aroma was more pronounced as the beer warmed.